Scottie Mom: Where did all the white stuff go? We stay in South Africa where we never get white stuff. But I love playing in the water daily and makes Mommy water the garden everyday so that I can play. Love Clarabel. We have PLENTY more we are happy to send you! We live in Michigan...'nuff said! It didn't come here. We didn't even see the snow in the mountains this winter. We have lots to offer, just got 12 more inches with our 3-4 feet we have already! The scotties boys have never seen this much snow. We have an inch or so. More is expected in a couple of days. I don't mind the snow too much if the temperature stays around 25-30 degrees. It's when it goes down into the teens or into the negatives that I'm not to happy about. Maya and Pierson too. They love snow, but not when it's that cold. Never got any white stuff. We are in Reno, But our two Scotties love to do snow angels in it! 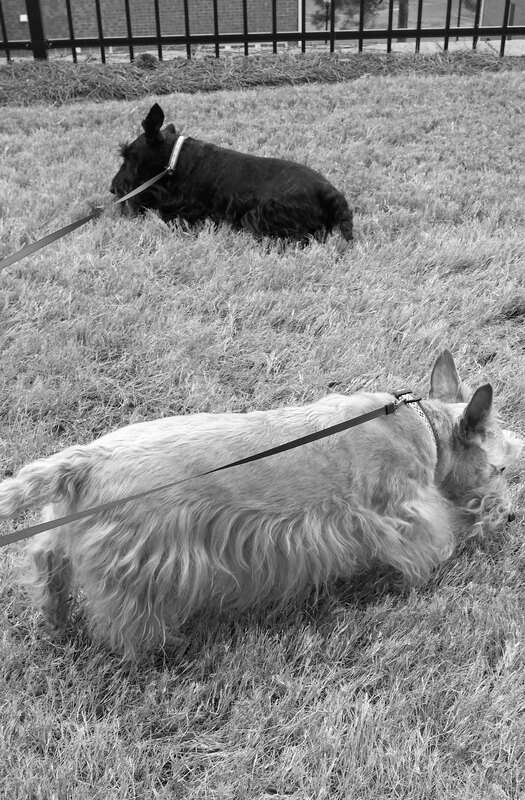 Scotties are the bestest dogs ever!!!!! We are on our 8th and 9th. We are across the pond so no white stuff here just endless rain. Actually we have had two days of dry and sun hooray. Have a serene Sunday and enjoy some big easy today. Well now, WE GOT 2 inches this morning, more Monday night and a dump truck load is expected thursday night. So we are having a easy pesy Sunday inside! We have a ton of the white stuff and love it. you can always send it our way. We are winter fans! It snowed a little this morning and then turned to drizzle. I don't mind the cold I just don't like it wet and cold. We still got lots of the white stuff here! Haven't seen any grass in a while! Oh wow, that was in ad out fast, wasn't it? Well glad you are free and clear, because it keeps coming back here and creating havoc. I would love to loose some of our white stuff...lol. Heather an’ Mistur K!! I founded yu! It sure does disappear fast sometimes....but we are getting more here in the north Georgia mountains today! There's no white stuff to play with here, but it's very wet!